The German Chemical Society (Gesellschaft Deutscher Chemiker, GDCh) has been collecting statistics on chemistry students in Germany for many years so that a huge amount of data on trends is now available. At the beginning of the 1990s German universities were happy with the way student enrolment was going in science and engineering. Then the slide started, and by the mid-1990s the press was full of stories about a lack of qualified graduates in the near future. When one asked around, this was not just a German situation, but also a European one; further inquiries indicated it seemed almost to be a world-wide problem! Entry into chemistry courses at German universities. The fall in numbers was dramatic in many German universities, down to a third or even a quarter of the former figures in many cases, though some institutions did not seem to suffer quite as badly. In 1991 the total enrolment in chemistry was close to 6000, but by 1995 it had dropped to under 3000 (see figure). The number of students studying biochemistry and food chemistry is quite small in comparison, with a total of around 600 in 1995. There is also (as in several European countries) a second set of institutions offering chemistry degrees, generally slanted towards chemical engineering, called “Fachhochschulen” (they are now called “universities of applied sciences,” but the term “polytechnic” might also be appropriate in some countries). Their chemistry enrollment in 1993 was around 1400 and dropped to 850 in 1998. The traditional first degree is the Diplom, which (on paper) takes five years, but Germany was unusual in that often around 90 percent of the chemistry graduates with this degree went on to obtain a Ph.D. (no other subject shows this kind of behavior). Presently, German institutions are in the throes of the “Bologna Process,” which means giving up the Diplom and changing to Bachelor and Master, but most universities have not yet enrolled students for these, and very few have graduated any new Bachelors as yet. Of course, the fall in enrollment meant that the number of Ph.Ds. coming out of the system would also fall, but with a big time lag. At the peak, about 2200 Ph.Ds. were graduated each year, but this number will continue to fall for a while yet: the number for 2004 was close to 1300. Towards the end of the 1990s the picture began to change again: numbers started to rise, but not everywhere at first. 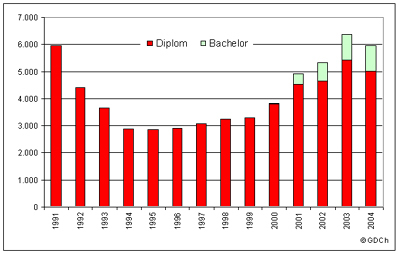 There was a steady rise in the total numbers, however, and by now they are almost exactly back to where they were at the 1990s peak, with 6000 freshmen in Diplom and Bachelor courses in 2004 (the figure was very slightly higher in 2003). In fact, the total enrollment is higher. As in 2004, around 1400 students began courses in biochemistry or food chemistry, while the Fachhochschulen attracted 1600. However, a recent round-the-table survey of other European countries showed that Germany is still really bucking the trend. In other countries numbers are either constant, dropping slowly each year, or rising slowly from a very low baseline. So why is the situation in Germany different? The short answer has to be “nobody knows.” It cannot be the change from the Diplom to a Bachelor/Master system, since in 2004 only around 1000 (17%) of the freshmen went into these courses, exactly the same number as in 2003. The number of students entering biochemistry, which has increased by a factor of nearly three since 1995, may give us a clue (the change in food chemistry is only very small over that period). The prefix “bio” certainly has an influence on the way young people think. Two cases from my own university will serve as examples: Our chemical engineering departments were desperately short of students until they introduced a new course dealing with biochemical engineering. They were swamped with beginners in the first two years and had to limit the numbers! Chemical engineering itself remained uninteresting. A year later, my own department changed to Bachelor/Master and offered two courses: chemistry and chemical biology. Chemistry attracted around 50 freshmen, chemical biology 120; the next year there was no change in the number for chemistry, but in chemical biology it was now 150! So for 2005 we shall have to limit the number of students. So are chemistry departments in other countries not offering the right courses? This cannot be the answer, as traditional chemistry is still a popular option in Germany, but not elsewhere in Europe. How about the image of chemistry? Germany had a “year of chemistry” in 2003, which certainly did make an impression, but will have virtually no effect on the numbers for 2004 (which in fact dropped slightly in any case!). So we have an unanswered question. What can chemists in other countries learn from the present German situation? Well, if you are looking for doctoral students or postdocs, Germany will still be a good source of them for the next few years! Terry Mitchell <terence.mitchell@uni-dortmund.de> is a professor at Dortmund University (Germany); he is national representative on the IUPAC Committee on Chemistry Education.